Guy called Dan Bowles, made an interesting discovery when accidentally lifted his Apple Mighty Mouse in certain angle. 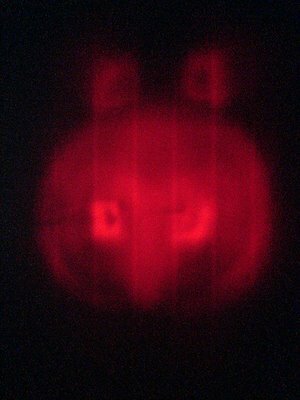 He looked at the red LED pattern underneath and this is what he found. As you see, when looking at the picture below, it forms the shape of a cartoon character Mighty Mouse. Is this a hardare Easter Egg made by Apple, or just a concidence? Check more pictures, and post your comments. 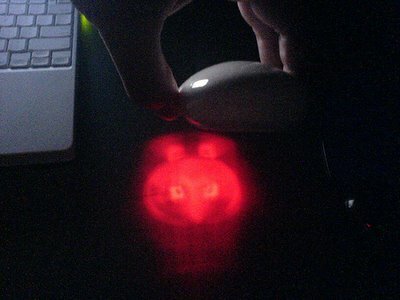 If you also have Apple’s Mighty Mouse, be sure to check this, and if it works, take the picture (if possible) and post the link in comments or email it. Enjoy! And the joke at the end :) Can you guess who this is? The Mighty Mouse must be tilted 45 degrees forward in order to get this projection. Otherwise, it’s just a squishy blob. 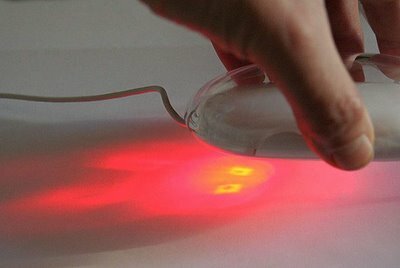 It’s just the natural shape of the LED that’s causing the variously sized circles. 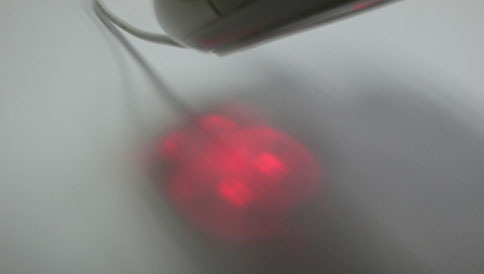 My Mac mouse is not mighty and also do this effect. I can see it – but Jason has sit right about the angle! Too funny. omg, that is flippin’ awesome!! this works with my mac mouse also. knowing the people at mac as well as I do (connections) it probably is more than just coincidental. very cool find though! mine shows a mountainscape. with trees and elk. 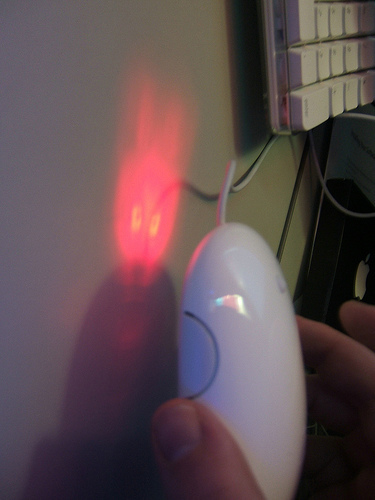 wow, i had one for at least a year, and never realized the projection looked like a mouse. I’m pretty sure that last one is either photoshopped or built in purposefully. well mine is a microsoft mouse and it makes tom cat!!! Are you sure this one isn’t Jerry? My HP mouse makes a fox or wolf with no eyes. My mom’s Apple Mighty Mouse also does this. I think it is very clever. how come my mouse doesent do that??? by the way, my mouse isnt moighty, its just a pro, and it still makes the mouse picture. pity the mouse is scratchy tho…. Mine to looks like a kind of jack o lantern. I totally knew that! I did it all the time w/ my mouse! Like the Steve Jobs illusion, though. thats cool. my mighty mouse does the same thing. i think it’s mostly coincidence but apple may have tweaked it a little. AWESOME!!! i have never seen anything like it! Mine recreates a full colour version of the mona lisa…. AS IF!!! GROW UP PEOPLE ITS PHOTOSHOP!!! mine (microsoft) shows a torch and fire. Its so cool! It also squeaks and plugs into a cheese wedge to recharge. For some reason mine looks like the Virgin Mary. And I’m not kidding. aww man… i’m still using the old rollerball mouses ='( are they out of style now? I have a cheapie “Micro Innovations” mouse and mine looks like the Autobot symbol. Isnt that Carl, the janitor from “The Breakfast Club” at the end? Mine makes the shape of a *ahem* female reproductive organ…. seriously. It’s Logitech. 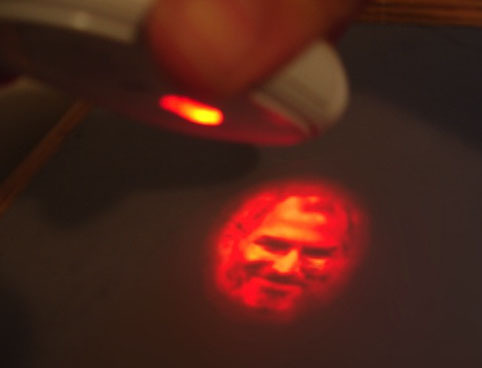 Cool.But I’m thinking you could(if you wanted to)put a stencil on the red LED light to make a picture. @mike: hope you’re kidding. it’s steve jobs..!! i have the magic mouse and it has no red light at all. This is pretty awesome I reckon I have the same mouse as Miranda. And I like the little joke at the end. Epic! Actually it doesn’t look like Mighty Mouse at all. But it curiously resembles an ordinary rat. Seems un-coincidental. Yes… All mighty mouse create this image…. Another one of the Steve’s masterpieces!!! we saw the face ,right away! I TRYED IT WITH MY MOUSE…..IT WORKED!! !